Welcome to All Sensors “Put the Pressure on Us” blog. This blog brings out pressure sensor aspects in a variety of applications inspired by headlines, consumer and industry requirements, market research, government activities and you. In this blog we’ll be discussing pressure during dry weather. In “The Rise of the Ridiculously Resilient Ridge,” the author points out that persistent high pressure in recent years led to extreme drought in California. 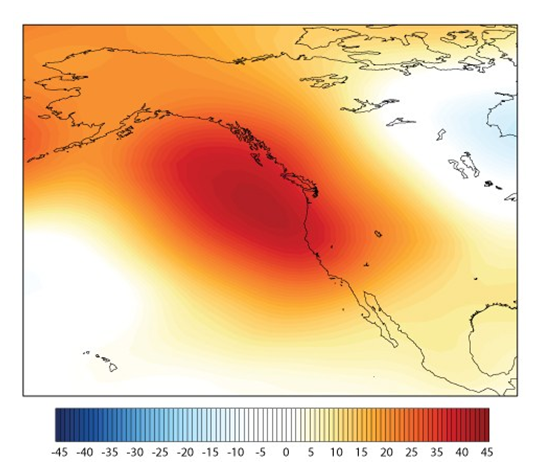 In fact, the terminology, “Ridiculously Resilient Ridge” of atmospheric high pressure is frequently used to describe ‘the unusually persistent atmospheric anomaly responsible for redirecting winter storms over the Pacific and ultimately bringing record-breaking warmth and dryness to the Golden State.” But what amount of high pressure is occurring? As shown in the figure below, a pressure of 45 mb above the middle atmospheric pressure (500mb geopotential height (GPH)) is attributed to be the cause of unusually persistent weather patterns. This level deflects storms that would bring rain and snow to ease drought conditions. With 1 bar = 1000 mb at sea level, 500 mb is near 5,500 meters (18,000 ft). In contrast to the ridge that tends to bring warmer and drier weather, a trough is a lower pressure region that tends to bring in cooler and cloudier weather as it approaches. Both are analyzed on pressure surfaces aloft such as 850, 700, 500 and 300 mb. In July 2016, according to the National Oceanic and Atmospheric Administration, a “heat dome” occurred over large portions of the United States. The websites states that “a heat dome occurs when high pressure in the upper atmosphere acts as a lid, preventing hot air from escaping.” This atmospheric occurrence forces air to sink back to the surface, warming the air even further on its way down. The heat dome that resulted from the high pressure prompted the National Weather Service to issue heat alerts for more than a dozen states across the U.S. Welcome to All Sensors “Put the Pressure on Us” blog. This blog brings out pressure sensor aspects in a variety of applications inspired by headlines, consumer and industry requirements, market research, government activities and you. In this blog we’ll be discussing pressure in protective suits. Reports of Centers for Disease Control and Prevention (CDC) biolab failures often provide a dramatic picture of a person in a HAZMAT (positive pressure) suit to demonstrate the hazardous environment. 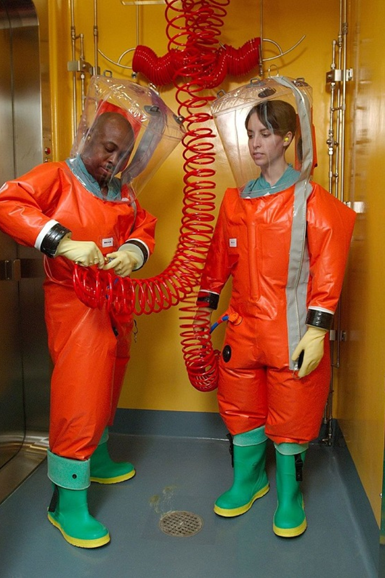 In fact, ventilated and reusable pressurized protective suits are available for use in Bio Safety Level 4 (BSL-4, deathly viruses) laboratories worldwide. According to the U.S. Army Medical Research Institute of Infectious Diseases (USAMRIID), there are four levels of biological containment, with BSL-4 being the highest level. In this environment, personnel must wear positive-pressure suits commonly called “space suits” and breathe filtered air. The air-tight suits are designed for positive pressure to prevent contamination to the wearer even if the suit becomes damaged. One company offers a ventilated protective suit for BSL4-1 environments that can withstand a 5.4 bar (78.3 psi) pressure and has a valve for continuous adjustment. To detect leaks, especially when the suit is used infrequently, periodic pressurized testing must be performed to maintain the integrity if the suit.